Leprosy, also known as Hansen’s disease, is a chronic infectious disease caused by Mycobacterium leprae. The disease mainly affects the skin, the peripheral nerves, mucosal surfaces of the upper respiratory tract and the eyes. Leprosy is known to occur at all ages ranging from early infancy to very old age. Leprosy is curable and early treatment averts most disabilities. The exact mechanism of transmission of leprosy is not known. At least until recently, the most widely held belief was that the disease was transmitted by contact between cases of leprosy and healthy persons. More recently the possibility of transmission by the respiratory route is gaining ground. There are also other possibilities such as transmission through insects which cannot be completely ruled out. It has a long incubation period (anything from two months to 40 years). There is a spectrum of clinical disease depending on the patient’s cell mediated immunity to the organism. It is still a serious problem globally, with 1–2 million people affected, mostly in the poor and underprivileged countries of Africa and Asia. Leprosy is one of the oldest diseases in recorded history. According to the World Health Organization (WHO), the first known written reference to leprosy is from 600 B.C. The skin lesion can be single or multiple, usually less pigmented than the surrounding normal skin. Sometimes the lesion is reddish or copper-coloured. 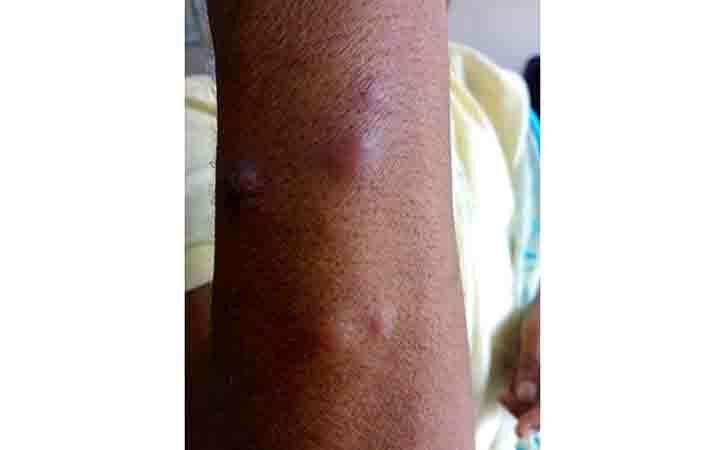 A variety of skin lesions may be seen but macules (flat), papules (raised), or nodules are common. Sensory loss is a typical feature of leprosy. The skin lesion may show loss of sensation to pin pick and/or light touch. Thickened nerves, mainly peripheral nerve trunks constitute another feature of leprosy. A thickened nerve is often accompanied by other signs as a result of damage to the nerve. These may be loss of sensation in the skin and weakness of muscles supplied by the affected nerve. In the absence of these signs, nerve thickening by itself, without sensory loss and/or muscle weakness is often not a reliable sign of leprosy. Leprosy can be classified on the basis of clinical manifestations and skin smear results. In the classification based on skin smears, patients showing negative smears at all sites are said to have paucibacillary leprosy (PB), while those showing positive smears at any site are said to have multibacillary leprosy (MB). Mycobacterium leprae was discovered by Hansen in 1874, but has still not been cultured in vitro, although it can be made to grow in some animals (armadillos, mouse foot-pads, etc.). In humans the main route of infection is through nasal droplets from cases of lepromatous leprosy although, some cases have occurred in Louisiana from eating infected armadillos. Leprosy is curable with a combination of drugs known as multidrug therapy (MDT), as the treatment of leprosy with only one antileprosy drug (monotherapy) will result in development of drug resistance to that drug. The combination of drugs used in the MDT depends on the classification of the disease. Rifampicin, the most important antileprosy medicine, is included in the treatment of both types of leprosy. For the treatment of patients with multibacillary leprosy, WHO recommends a combination of rifampicin, clofazimine and dapsone; for patients with paucibacillary leprosy, MDT uses a combination of rifampicin and dapsone.